Alina (Cristina Flutur) returns to the impoverished Romanian community of her childhood in the hope of reuniting with Voichita (Cosmina Stratan) and returning with her to Germany and a new life. Upon arrival though, Alina discovers that Voichita has set up a new life for herself in a remote monastery and replaced her love with that of God. Undeterred, yet at the risk of her own mental wellbeing, Alina desperately tries to undermine the monasteries priest (Valeriu Andriuta) and reclaim Voichita’s devotion. In Beyond the Hills, Romanian-born writer-director Cristian Mungiu’s follow-up to the award-winning and acclaimed 4 Months, 3 Weeks and 2 Days, the complicated bond between two women is once again put under the spotlight. Alina and Voichita, once unified, have been separated for several years, each influenced by life in different ways. Alina has become strained under the pressure of her desired independence, while Voichita has found acceptance – and love – with God and the religious order of the monastery. Mungiu doesn’t stop there though, as Beyond the Hills also incorporates elements of religion, horror and social realism into its mediating, yet enthralling compass. There’s a lot of fascinating ideas touched upon over the course of the lengthened narrative, from the priest’s shady intentions with the nuns (it’s implied that he abuses their virtue on several occasions) to the possibility that Alina may be possessed when they suspect her mental health could be deteriorating, but these are unsubstantial in depth. It’s clear throughout that Mungiu’s expertise lies elsewhere in the narrative, whether it be in the continuously fluctuating relationship at its core, Alina and Voichita’s conflicting belief systems or the examination into the repercussions faith can cause. It’s sparse and sober at its core, with a lot left to individual interpretation (is faith a help or obstacle), but when it dips in focus – the middle act is predominantly arduous filler offering nothing of particular relevance – there’s a noticeable loss in its overall fortitude. That’s not to undermine Beyond the Hills’ strength as both a character piece and examination into the power come hindrance and detriment of faith and religion. Mungiu’s strong, yet understated direction not only stresses the harsh surroundings the community is subjected to on a day-to-day basis but also implies how it could effect their understandings of what’s appropriate and what’s inappropriate. 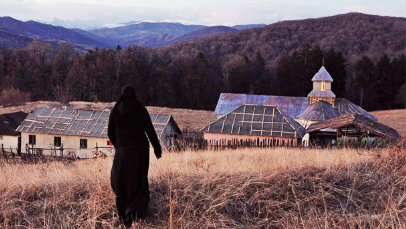 The cinematography, executed by Oleg Mutu, is a shelling of beautifully opaque long takes, furthering primarily the feeling of seclusion and trepidation of the outside world by the boundaries of the monasteries immediate vicinity. Rounded out with fantastic performances – Flutur and Stratan are the stand-outs, while Andriuta commendably conveys his characters unreadable ambition and disposition – Beyond the Hills may not be for everyone, but there’s no denying that it’s as intoxicating in its suggestions as it is alluring in its depiction of two people segregated by their differing beliefs – something that can be understood, scrutinised and applied to everyday life by those with the willingness to invest themselves entirely. This review was originally posted on HeyUGuys.